Chances for a good C11: 50-50, 60-40, 80-20? HoTech has two videos on Youtube that detail its use. Watch them multiple times and watch them closely. For GEM mounts, use the mount's polar alignment adjustments. If you place the OTA horizontally, you need to use just the Az polar adjustment and the DEC axis can be used for up/down. However, I found that collimating a 14-inch scope horizontally resulted in it being miscollimated when pointed up. So, I collimated it pointed up at 45° and the results were better. But when you point it up, you have to use both polar Az and Alt adjustments to 'co-align' it with the HoTech CTC but the movements will be non-orthogonal, i.e., adjusting each axis results in the cross moving both up/down and left/right, a bit like SCT collimation screws. But it's easy to learn how to make it go where you want. "Swing the scope to one side of the mount so the bar is in horizontal position (scope on one side and counter weight on other side). This way, the scope adjust only up/down for co-alignment. Then you need to move the collimator left/right in position to cover this missing scope left/right aiming adjustment. We suggest mounting an additional linear rail slide between the fine adjustment stage and the collimator to achieve this adjustment without lifting and moving the collimator side way for small adjustments." Frankly, after reading all of these posts, I am questioning my wisdom on getting this device just to save the hassle of waiting for a night with excellent seeing to collimate with a star using the AstroGold mask which is much better than the standard donut method. However, I will give it a try and see how it goes. On another note: I was looking for M3 x 12mm stainless steel hex screw caps to replace the 3 phillip screws but no luck unless a buy a pack of 50 and have to wait a week to get them. So, just going to try with the current screws like I have in the past. Edited by Umasscrew39, 27 November 2018 - 04:43 PM. As I said before, horizontal collimation is unlikely to satisfy you. I'd forget David's suggestions and just use the polar alignment adjustments of your mount with the ota pointed up. No idea what's wrong with doing a normal collimation on a decent night instead of spending $500+ to perform a worse collimation with your scope pointed sideways.. However, I found that collimating a 14-inch scope horizontally resulted in it being miscollimated when pointed up. So, I collimated it pointed up at 45° and the results were better. I may have seen this. I flipped the whole thing over to the other side and things were off a bit, but I was just trying it quickly as I was packing things up, so I didn't really get things aligned carefully again and thought that's what was going on. I'll be more careful and test for this when I get better at the whole procedure and do it "for real". I've always just used the donut method too, but there's more to it. The secondary, while pointing the right direction, may not be in the middle of the corrector, or the corrector may not be in the middle of the scope. Then this HoTech setup also checks the alignment of an independent focuser that you may have on the back of the scope. However, it just kinda glosses over the main mirror shifting about. On this C11 there is a dark grey washer between, I'm guessing, a big nut that holds the secondary mount in the center of the corrector and the corrector itself. It's not centered. There's a little bit more washer sticking out on one side than the other. I was thinking this collimator would tell me if the secondary mount is off-center or not. Maybe it did and I just missed it. The procedure for checking that is clearly shown in the videos and the HyperStar instructions, but not the regular instructions. I was able to get the scope and the target aligned with each other after a bit. I have a bubble level on the scope saddle to get the tube level. I don't know if that helped or not. It looks like you can do it at any angle. They do make a big deal about getting that correct to start with. The funny thing was that when I switched to my Edge 8 at the very end of the day it all seemed to line up instantly. I just had to move the tripod for the target over a little bit, because the scope was a smaller diameter. There are about 12 things going on at a time, so it's tricky. Any movement of anything can throw all the rest off. Just get the initial cross pattern in the center. I had the scopes on my Mach1 mount with the RA rotated all the way over to one side. The rotation of the tube (like the "top" of the tube) doesn't have to physically be "up", so an EQ mount is OK. I'll probably use my Evolution mount for the Edge 8/HyperStar and the Super C8 that I want to check. Oh, I have V8 of the instructions. They came with a new system. I'll see if I can get the newer ones. The diffuser strips look a lot like Scotch brand Magic Tape to me. They turn the four crosshair lines into a donut, so with or without them works. My instructions didn't say anything about the little target on the 1-1/4 or 2" mirror that you put on the back end, but they must be there for a reason. Just go slow and get each step right before moving on. I played around a lot just to see what moving each thing would do to the patterns and then sitting for a second to make sure I understood what was going on. Those lasers are bouncing all over the place. I didn't get far enough to try the HyperStar stuff. That is what i gotta wonder about all these years. Maybe the optics were off center. I will tear into my C8 this weekend and clean the haze and see what is up. I mean anyone can collimate SCT after a few times. I start with a lower power eyepiece and defocus and then go to around 450x and get a star just about in focus to fine tune. Very easy to see if the collimation is off. even with the optics off center you will still be able to align on a star and center the doughnut. However, that does not mean the the scope both mechanically and optically is aligned. The primary, secondary and corrector have to been on center to each other. Also, there are alignment marks on the primary and secondary and corrector that have to be aligned to each other because that is how they were optically aligned figured at the factory to go together. 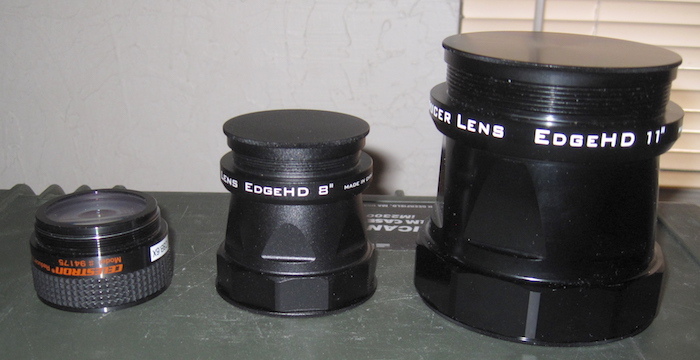 Just one of those has to be off and you have a mush scope even though at the eyepiece it looks aligned. Between myself and Club members I think 4-5 Celstron SCTs 8s and 11s purchased in past couple of years and all of them good. I only sold mine cause I prefer to push a dob/refractor. Even down in in Florida it took about an hr to really get optics temp right but they all put up good views. Don’t worry I think you’ll get a good one. This one looks to be OK. I still haven't gotten it dialed in, but haven't noticed anything gross in (just) a couple of outings of just looking. I'm still figuring out the HoTech collimator. The collimator says my Edge 8 is in good shape, but then I keep throwing the HyperStar monkey wrench into the mix and I can see things aren't aligned in pictures. Haven't tried the extra reflector for the HyperStar lens with the collimator yet. 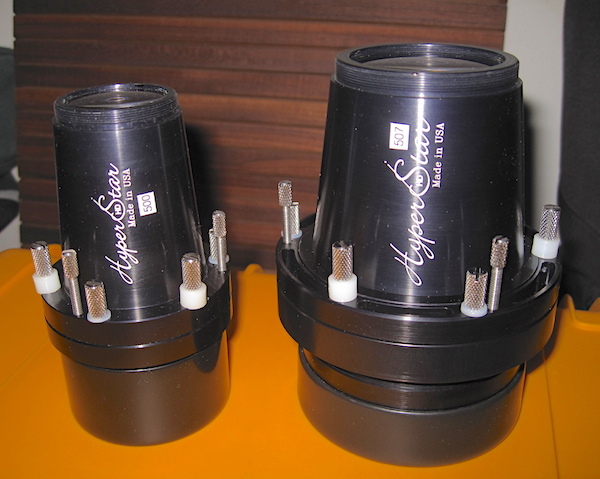 I've got a HyperStar for the 11 on order, so I can complicate the collimation operation there too. I wish we'd get to the cold clear part of winter, so I could work with everything more and then check the results in the real world. So far so good, though. Edited by NMBob, 07 December 2018 - 01:57 PM. I have owned three C11's in the past 10 years or so. The first two were so-so optically but my newest one bought from HPS about 2-3 years ago is excellent, by far the best one. I saw some sharp detail on Jupiter, Saturn and Mars over the past several months with it, using a Pentax 10XW. Also an excellent double/triple star splitting scope. Could not agree more- what a purchase mistake this was. I'll stick with using my GoldAstro mask which basically fine tunes the donut method on a star with good seeing. I thought my Edge 8 stuff was big. That's the new HyperStar v4 for the 11. HSv3 for the 8. Will only be taking my Edge 8 with me for Christmas break, so will resume looking at the 11 in a couple weeks. Still nothing glaringly wrong. Still messing with the collimator, but only a couple times a week. Should get to get something real, like a picture or something, going the first weekend in Jan.